About AccountSight: AccountSight is a robust and easy online time tracking, resource forecasting, expense recording and invoicing software. 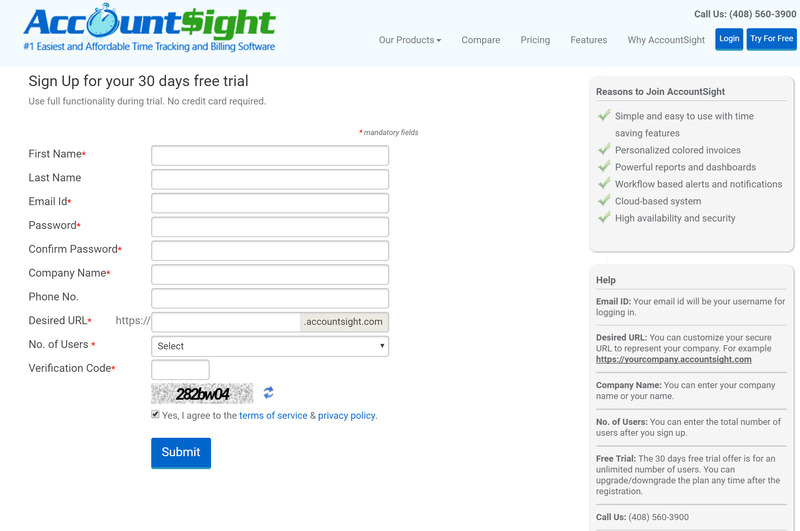 For more information and to learn about free time tracking software trial period, please click on the link: https://www.accountsight.com/registration/. Registration: To access AccountSight for personal or business use, you first need to register for it. Once your registration is successful, a subdomain specific to you or your organization will be created and accordingly a unique URL will be created. You will be assigned as the Administrator for the account. You can go to the URL, login using your credentials and access AccountSight anytime, anywhere. As an administrator, you can create users, time tracking, expense tracking and billing related configurations. 1] Go to the Sign Up page in AccountSight website. 2] Full up basic information like Name, Email Id, Password etc. 3] Fill up specific information like Company Name, Desired URL, No. of Users etc. 4] Submit all the information. 5] Once you submit, a confirmation mail will be sent to you with your subdomain URL. You can access AccountSight as the Admin of your account within few seconds after confimation.